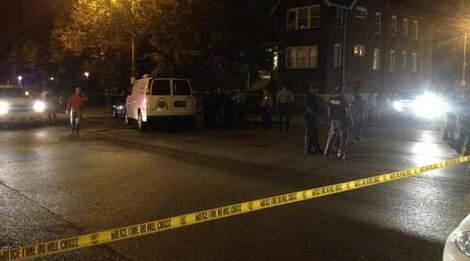 ST. LOUIS - An attorney for the family of a black 18-year-old shot and killed last October by an off-duty, white St. Louis police officer said Tuesday he plans to file a wrongful-death lawsuit, after a prosecutor said the officer would not face criminal charges. In a 51-page report released Monday, St. Louis Circuit Attorney Jennifer Joyce said her office's "independent and exhaustive investigation" concluded that a criminal violation could not be proven beyond a reasonable doubt in VonDerrit Myers Jr.'s death. The report, which did not identify the officer because no charges were filed, said that "given all the available facts, witness statements, (and the) physical and forensic evidence," the officer shot and killed Myers in self-defense after Myers first fired at him. A statement by St. Louis Police Chief Sam Dotson identified the officer as Jason Flanery, a six-year veteran of the department. A message left Tuesday, with Flanery's attorney, Brian Millikan, was not immediately returned. Myers's Oct. 8 death fanned racial unrest that had erupted two months earlier after the killing of black, unarmed 18-year-old Michael Brown by white police officer Darren Wilson in nearby Ferguson. Brown's death led to sometimes-violent protests in Ferguson and other U.S. cities, spawning a national "Black Lives Matter" movement seeking changes in how police deal with minorities. A St. Louis County grand jury and the U.S. Justice Department declined to charge Wilson, who later resigned. But the Justice Department released a scathing report that cited racial bias and racial profiling in Ferguson policing, along with a profit-driven municipal court system that targets blacks. "This is a tragic situation for our entire community, and my thoughts and prayers remain with the Myers family. I know their loss is heartbreaking," Joyce said in a statement. "I want to express my appreciation to the community for its patience. This is a challenging time for law enforcement across the country, and I believe in the power of the community and law enforcement working together to keep our community safe." An attorney for Myers' family, former prosecutor Jerryl Christmas, dismissed Joyce's findings, insisting Tuesday that Myers was unarmed and never fired at the officer, who was patrolling a neighborhood as a security officer in a marked private security car. Myers' mom, Syreeta Myers, said after the shooting her son was holding a sandwich when the officer killed him. Christmas alleges the officer planted the gun near Myers' body, and he likened the case to last month's South Carolina shooting death of a black man, Walter Scott, by a white police officer who said he fired after the man fought him for his stun gun. That officer, Michael Slager, has been charged with murder in the case, after video recorded on a bystander's cellphone showed Scott running from Slager when he was shot. "I know from working in the prosecutor's office that the easiest thing for an officer to do is throw a gun on you, and I believe that's the case here," Christmas told The Associated Press. "The issue here is this: Whoever has control of the crime scene controls the narrative. Anyone who works the investigation knows that." Christmas said he plans to file a wrongful-death lawsuit by the end of this month, saying the officer who killed Myers "acted irrationally" and that "this family needs to be compensated for their loss." Joyce's report said the officer had reason to suspect Myers, who was shot eight times, was armed and that two guns were fired during the confrontation, with shots coming from both directions. "Based upon the investigation, prosecutors concluded that Mr. Myers produced a firearm on the evening in question," Joyce's report read, adding that "no witness claims to have seen (the officer) alter evidence in any way, such as throw down a gun, fire a weapon in any direction other than towards Mr. Myers or scatter bullet casings." Joyce said the officer declined to be interviewed for her investigation.